This was one of the contenders for the Morris Award this year, given to the best debut young adult title (first book to be published by the author in any genre and for any audience). While I can see its merits, I can also understand why it didn't take the main prize. Wonder Show follows the story of Portia Remini, who has been abandoned by her family and left at McGreavy's Home for Wayward Girls, under the "care" of someone everyone just calls "Mister." It's terrible there, but Portia has learned how to get from day to day, all while hoping to find her file and information about where her father might be. Until something so terrible happens that she knows she needs to get out. This is how she eventually finds her way to Mosco's Traveling Wonder Show, a sideshow for circuses where "human oddities" are the main attraction. Portia is a "normal," someone who is useless for the show, but eventually finds herself as the apprentice for the ballyhoo, the storyteller that brings in the customers. As she learns to live and work with her new companions, she continues to look for her father, and wonders how long it will take Mister to finally catch up with her. The way this story is told is not one I typically see in YA literature, but it was very effective. The chapters alternate viewpoints between third-person omniscient and first-person narration for each member of the Wonder Show. Almost every member of the Wonder Show gets a short chapter where they explain how they see the events and the world in general, and their views are not always what a reader might expect them to be. It was illuminating without giving too much of the story away; it was just enough to make us understand their world and their desires a little better. Readers will also learn a lot about the American history of these sideshows, as well. In the end, the author's note talks about all the real people Barnaby based her characters on, including a pair of conjoined twins, a human pincushion, and giants. It is a fascinating world, one that is usually less than ideal for the so-called "freaks" who managed to make a living not only despite, but because of their physical differences during the Great Depression. Despite its many merits, I'm not surprised this didn't win the Morris Award, only because it seemed like not enough to me. I wanted to know more about the characters, wanted to go deeper into their lives and further into their story. I also agree with the committee that Seraphina by Rachel Hartman, the winner, was indeed better. I would definitely recommend this novel to readers who are looking for a darker, grittier realistic or historical fiction novel but isn't too graphic. I was often reminded of Water for Elephants by Sara Gruen while reading this, so I would also recommend this to people who enjoyed that book. It's a lighter story than that one, but delves into the dark life of the traveling circus during its heyday. Disclosure: I checked out this e-book from my public library. Nice review, Tahnleen! It sounds like an interesting book. 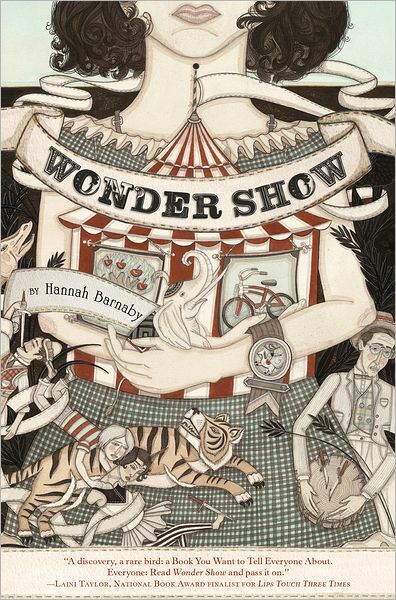 Is it my imagination, or have there been more circus books in the last few years? So many circus books! However, being that this one is historical fiction (rather than containing any magic, which is what most of the other ones do) I feel like I may need to give this one a shot! Ooh, good, I was looking for my next read!